Starting with Windows 10 version 1607 "Anniversary Update" the classic version of Sticky Notes was replaced with a Universal(UWP) app with close integration with Cortana and Search. 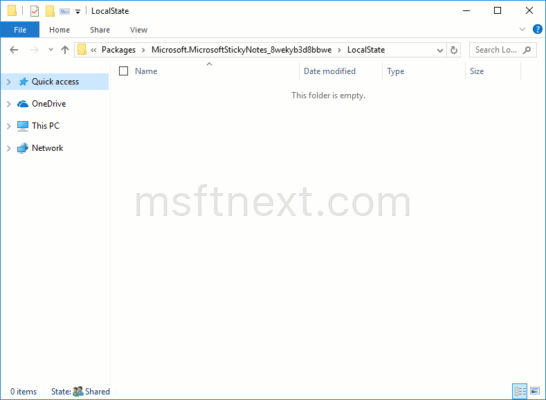 It is possible to convert classic Sticky Notes from Windows 7, Windows 8 or an older Windows 10 release to the new format. It is possible to covert classic Sticky Notes to the new format. Create a new folder named 'Legacy'. 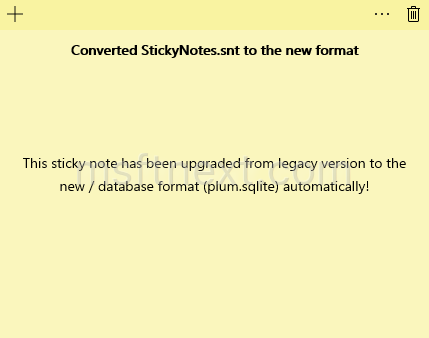 Under the Legacy folder, copy your StickyNotes.snt file from the previous app version, and rename it to ThresholdNotes.snt. Start the new Sticky Notes app. The app will reads the .snt file from the Legacy folder and convert its contents to the file format automatically. This fix no longer seems to work. I tried it and noting happens when I launch the new Sticky Notes app. Quite possible. Which Windows version you have installed? Same thing here, nothing at all. I’m running v1709 Build 16299.192. Go to PC Settings > System > Apps & Features > Sticky Notes > Advanced Options > Reset. All app data will be deleted. Do not open Sticky Notes app now. All notes will now appear!!! Go to PC Settings > Apps & Features > Sticky Notes > Advanced Options > Reset. All app data will be deleted. Yes – this works even with 1709. THANK YOU!!! !